Cover of light novel volume 1 featuring Index. A Certain Magical Index (とある魔術の禁書目録 (インデックス), Toaru Majutsu no Indekkusu) is a Japanese light novel series written by Kazuma Kamachi and illustrated by Kiyotaka Haimura, which has been published by ASCII Media Works under their Dengeki Bunko imprint since April 2004. The plot is set in a world where supernatural abilities exist. The light novels focus on Tōma Kamijō, a young high school student in Academy City who has an unusual ability, as he encounters an English nun named Index. His ability and relationship with Index proves dangerous to other magicians and espers who want to discover the secrets behind him, Index as well as the city. Yen Press have licensed the novels in North America. A manga adaptation by Chuya Kogino began serialization in Monthly Shōnen Gangan from May 2007. J.C.Staff produced two 24-episode anime series between 2008 and 2011. An animated film was released in February 2013. The anime adaptations are licensed in North America by Funimation. A 26-episode third season aired between 2018 and 2019, licensed by Crunchyroll. A Certain Magical Index is set in a world where supernatural abilities are a reality. Individuals who possess special powers acquired via science are called Espers (超能力者, Chōnōryokusha). Those Espers who gain their abilities without the aid of special scientific instruments, whether at birth or otherwise, are referred to as Gemstones (原石, Genseki). Others, known as Magicians (魔術師, Majutsushi), gain their powers upon mastering the power of magic, either from obtaining knowledge from different mythologies or by using mystical artifacts, though the existence of magicians is a secret to the public. While Magicians align themselves with different beliefs, Espers are aligned with scientific institutions. This leads to a power struggle between the magic and science factions for control of the world. The story is set in Academy City (学園都市, Gakuen Toshi), a technologically advanced city located in west of Tokyo that is known for its educational and research institutions. Tōma Kamijō is a student in Academy City whose right hand, the Imagine Breaker, has the ability to negate any supernatural power, but also negates his own luck, much to his chagrin. One day, Tōma meets a young English girl named Index – a nun from Necessarius, a secret magic branch of the Church of England, whose mind has been implanted with the Index Librorum Prohibitorum – 103,000 forbidden magical books that the Church has stored in secret locations. His encounter with her leads him to meet others from the secret worlds of science and magic. Tōma's unusual power places him at the center of conflicts between the Magicians and Espers in Academy City who try to unravel the secrets behind Academy City, Index, and Tōma's own special power. Besides its own manga adaptation, the series also has two manga series which are side stories focusing on other main characters. One of them is A Certain Scientific Railgun, which focuses on Mikoto Misaka, an Electromaster and one of the most powerful Espers in the city. The second, A Certain Scientific Accelerator, focuses on Accelerator, a teenager who can control vectors, known as the most powerful Esper in Academy City. A Certain Magical Index began as a light novel series written by Kazuma Kamachi, with illustrations by Kiyotaka Haimura. ASCII Media Works published 25 volumes between April 10, 2004 and August 10, 2011 under their Dengeki Bunko imprint; 22 comprise the main story, while the other three are short story collections. Yen Press has licensed the series in North America and began releasing it under their Yen On imprint in November 2014. 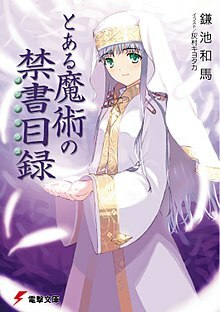 A sequel series of light novels titled New Testament: A Certain Magical Index (新約 とある魔術の禁書目録, Shin'yaku Toaru Majutsu no Index) began publication on March 10, 2011; there have been 21 volumes published as of October 10, 2018. The series has been adapted into two manga series. The one based on the novels is illustrated by Chuya Kogino and started serialization in the May 2007 issue of Square Enix's Monthly Shōnen Gangan. The first tankōbon volume was released on November 10, 2007 and as of February 22, 2014, 13 volumes have been published. Yen Press has licensed the series in North America. The manga is also published in Italy by Star Comics and in Germany by Carlsen Comics. A manga adaptation of the film Toaru Majutsu no Index: Endymion no Kiseki, illustrated by Ryōsuke Asakura, began serialization in the March 2013 issue of Monthly Shōnen Gangan. A 24-episode anime adaptation of A Certain Magical Index was produced by J.C.Staff and directed by Hiroshi Nishikiori, and aired in Japan from October 4, 2008 to March 19, 2009. The anime was collected into eight DVD and Blu-ray Disc sets which were released from January 23 to August 21, 2009. In addition, four mini bonus episodes depicting Index super deformed, titled A Certain Magical Index-tan, were bundled with limited edition copies of the first and fifth DVDs of the first season, and the first BD/DVD release of the second season. The anime covered the first six novels in the series. Funimation licensed the series in North America. An English language dub began streaming on Funimation's website in September 2012 and was released on DVD on December 11, 2012. The first season aired in North America on the Funimation Channel on January 21, 2013. A second season, titled A Certain Magical Index II, aired in Japan between October 8, 2010 and April 1, 2011, and was also streamed on Nico Nico Douga. The limited edition of the first BD/DVD volume of Index II, released on January 26, 2011, contained a A Certain Scientific Railgun mini-novel. The first season of the English dub was released in 2012 while season 2 was released in 2014. An animated film titled A Certain Magical Index: The Movie – The Miracle of Endymion (とある魔術の禁書目録 エンデュミオンの奇蹟, Toaru Majutsu no Index: Endyumion no Kiseki) was released to Japanese theaters on February 23, 2013. It is based on an original story written by Kamachi and features the main characters from both Index and Railgun along with new ones designed by Haimura. Funimation has licensed the film in North America to be released in 2014. The film was released in North America on January 13, 2015. The 26-episode third season of the anime series aired from October 5, 2018 to April 5, 2019. Funimation has licensed the third season of the series for North America, United Kingdom, Ireland, South Africa, Australia and New Zealand; meanwhile, Crunchyroll has licensed it for the rest of the world, except Asia. The world of A Certain Magical Index is featured in the video game Dengeki Gakuen RPG: Cross of Venus for the Nintendo DS. Index appears as a supporting character, while Mikoto is a playable character which can be made accessible through playing the game and Accelerator is featured as a boss. A fighting game titled A Certain Magical Index, developed by Kadokawa Games and published by ASCII Media Works for the PlayStation Portable (PSP), was released on January 27, 2011. Namco Bandai Games and Banpresto produced a crossover title, Toaru Majutsu to Kagaku no Ensemble (とある魔術と科学の群奏活劇, Toaru Majutsu to Kagaku no Ansanburu, A Certain Magical and Scientific Ensemble), for the PSP. The game, which takes place a few days before the events of the film, was released on February 21, 2013. Index also makes a cameo appearance in the Ore no Imōto ga Konna ni Kawaii Wake ga Nai PSP game, being another game based on a light novel series published by ASCII Media Works. A 2D fighting game developed by Sega titled Dengeki Bunko: Fighting Climax was released in March 2014 which brings together characters from light novel series published under Dengeki Bunko imprint. Mikoto Misaka is a playable character while Tōma Kamijō and Accelerator are assist characters. Maiko Iuchi of I've Sound was in charge of the music in the A Certain Magical Index anime. Four pieces of theme music are used for the episodes: two opening themes and two ending themes. The first opening theme is "PSI-Missing" by Mami Kawada, and was used for the first 16 episodes during the television broadcast, but was changed to the first fourteen episodes in the DVD releases. The second is "Masterpiece" by Kawada, and is used in the subsequent episodes. The first ending theme is "Rimless (Fuchinashi no Sekai)" (Rimless 〜フチナシノセカイ〜, lit. "Rimless (Rimless World)") by Iku, and is used for the first 19 episodes. The second is "Chikaigoto (Sukoshi Dake Mō Ichido)" (誓い言 ～スコシだけもう一度～, lit. "Oath (Just a Bit, One More Time)") by Iku, and is used in the subsequent episodes. A single for "PSI-Missing" was released on October 29, 2008. A single for "Masterpiece" was released on February 4, 2009. The first opening theme song of A Certain Magical Index II is titled "No Buts!" by Kawada and the single was released on November 3, 2010. The second opening theme is titled "See Visions" by Kawada and was released on February 16, 2011. The first ending theme song is titled "Magic∞World" by Maon Kurosaki and the single was released on November 24, 2010, and was used for the first 13 episodes of the season. The second ending theme is titled "Memories Last" (メモリーズ・ラスト, Memorīzu Rasuto) by Kurosaki and was released on March 2, 2011, and is used for the subsequent episodes of the season. Iuchi is once again in charge of music direction and composition for Index II. The main theme song of the film A Certain Magical Index The Movie: Endymion's Miracle is "Fixed Star" by Kawada and the single was released on February 20, 2013. The opening theme for the A Certain Magical Index PSP game is "Answer" by Kurosaki, the B-side song included on her single "Magic∞World". The first opening theme song of A Certain Magical Index III is "Gravitation" by Kurosaki, and the second ending theme song is "Kakumei Zenya" (革命前夜) by Yuka Iguchi. The second opening theme is "Roar" by Kurosaki, and the second ending theme is "Owaranai Uta" (終わらない歌, lit. "Never-Ending Song") by Iguchi. A drama CD was released as a mail-in order of Dengeki hp volume 48 and was released later in November 2007. There are two parts to the story: the first part originally aired as a radio drama in Dengeki Taishō and starts with an encounter with the mysterious self-proclaimed "former" magician by Tōma Kamijō and Index in the family restaurant after Misaka decides to go back due to urgent business. The second part is about Mikoto Misaka and Kuroko Shirai with their "urgent business", and a duel request by a Level 3 Psychic girl from Tokiwadai. Weiß-Schwarz has adapted Index and Railgun into a playable and collectible card game. An official visual book of A Certain Scientific Railgun was released on July 24, 2010, bundled with a DVD containing a five-minute bonus episode. As a collaboration with Sega's Virtual On video game franchise, Kamachi wrote the light novel A Certain Magical Virtual-On (とある魔術の禁書目録×電脳戦機バーチャロン とある魔術の電脳戦機 (バーチャロン), Toaru Majutsu no Index x Dennō Senki Virtual-On: Toaru Majutsu no Virtual-On) released on May 10, 2016 with mecha illustrations done by Hajime Katoki. Sega AM3 and Dengeki Bunko later collaborated to develop the video game adaptation for the PlayStation 4 and PlayStation Vita released on February 15, 2018. In Kadokawa Shoten's Light Novel Award contest held in 2007, A Certain Magical Index was a runner-up in the action category. The light novel series has ranked three times in Takarajimasha's light novel guide book Kono Light Novel ga Sugoi! published yearly: fourth in 2009, ninth in 2010, and first in 2011. Between the 2010 and 2014 issues of Kono Light Novel ga Sugoi!, Mikoto Misaka was voted the No. 1 ranked female light novel character, now five times in a row, a feat not achieved by any other light novel character. Tōma Kamijō was voted the No. 1 ranked male light novel character in the 2011 issue. Upon release of the first volume of A Certain Magical Index, according to editor Kazuma Miki, "(to be blunt) it sold like crazy. Shortly after the official release date, we had to do a reprint half the size of the original printing. It was on a Monday. I still remember it now. It was quite an achievement for an unknown newcomer". In May 2010, it was reported that A Certain Magical Index became Dengeki Bunko's No. 1 bestseller and it became the first Dengeki Bunko series to sell over 10 million copies. Later that year, it became the fifth best selling light novel in Japan, beating other popular series such as Full Metal Panic!, Shakugan no Shana, and Haruhi Suzumiya. It was reported in October 2014 that the entire franchise including the light novels and manga had sold over 28 million copies. It was reported in August 2017 that the light novels have sold over 16.35 million copies in Japan. As of July 2018, the series was reported to have sold over 30 million copies. ^ Legulalp, Serdar (March 3, 2014). "A Certain Magical Index: Season One - A review of the fantasy / action anime series in English courtesy of FUNimation". About.com Anime. About.com. Archived from the original on August 13, 2014. Retrieved August 12, 2014. ^ とある魔術の禁書目録 [A Certain Magical Index] (in Japanese). ASCII Media Works. Retrieved November 11, 2013. ^ とある魔術の禁書目録(22) [A Certain Magical Index (22)] (in Japanese). ASCII Media Works. Retrieved November 11, 2013. ^ "とある魔術の禁書目録SS" [A Certain Magical Index SS] (in Japanese). ASCII Media Works. Retrieved November 11, 2013. ^ "とある魔術の禁書目録SS(2)" [A Certain Magical Index SS (2)] (in Japanese). ASCII Media Works. Retrieved November 11, 2013. ^ "とある魔術の禁書目録SP" [A Certain Magical Index SP] (in Japanese). ASCII Media Works. Retrieved November 11, 2013. ^ "Yen Press Adds A Certain Magical Index Light Novels". Anime News Network. April 19, 2014. Retrieved April 19, 2014. ^ 新約 とある魔術の禁書目録 [New Testament: A Certain Magical Index] (in Japanese). ASCII Media Works. Retrieved November 11, 2013. ^ 新約 とある魔術の禁書目録(21) [New Testament: A Certain Magical Index (21)] (in Japanese). ASCII Media Works. Retrieved February 17, 2019. ^ "Yen Press Licenses A Certain Magical Index, Trinity Seven, Chaika - The Coffin Princess, Prison School Manga". Anime News Network. October 10, 2014. Retrieved October 10, 2014. ^ "A Certain Magical Index Film Inspires Manga Series". Anime News Network. January 12, 2013. Retrieved January 12, 2013. ^ "Toaru Majutsu no Index Light Novels Get TV Anime". Anime News Network. June 4, 2008. Retrieved June 4, 2008. ^ "Funimation's A Certain Magical Index DVDs Delayed 6 Weeks". Anime News Network. September 17, 2012. Retrieved September 18, 2012. ^ "North American Stream List: Sept. 24-31". Anime News Network. October 1, 2012. Retrieved October 2, 2012. ^ "Funimation Week 4 of 2013". Funimation. Retrieved January 18, 2013. ^ "Toaru Majutsu no Index's 2nd Season Green-Lit". Anime News Network. June 7, 2010. Retrieved June 7, 2010. ^ "Nico Nico to Stream 7 More Anime Right After Airing". Anime News Network. September 13, 2010. Retrieved September 13, 2010. ^ "Index II DVD/BD 1 Pre-Orders to Bundle Bonus Anime". Anime News Network. October 15, 2010. Retrieved October 15, 2010. ^ "Toaru Majutsu no Index Novels' Haimura Draws Film's New Characters". Anime News Network. June 7, 2011. Retrieved June 25, 2011. ^ "A Certain Magical Index Film Slated For February 23, 2013". Anime News Network. July 3, 2012. Retrieved July 4, 2012. ^ "A Certain Magical Index Film's 1st Promo Streamed". Anime News Network. August 10, 2012. Retrieved August 10, 2012. ^ "2018年『とある』プロジェクト始動！ 『とある魔術の禁書目録III』TVアニメ制作決定" (in Japanese). ASCII Media Works. Retrieved October 1, 2017. ^ "A Certain Magical Index Season 3's Cast, Staff, October Premiere Revealed". Anime News Network. June 8, 2018. Retrieved June 8, 2018. ^ "Funimation on Twitter". Twitter. Retrieved October 11, 2018. ^ "Crunchyroll Announces Final Fairy Tail Anime and More for Fall 2018". Crunchyroll. September 28, 2018. Retrieved October 8, 2018. ^ "PSP専用 格闘アクションゲーム『とある魔術の禁書目録＜インデックス＞』" [For PSP Hand-to-hand Action Game Toaru Majutsu no Index] (in Japanese). ASCII Media Works. Retrieved July 20, 2010. ^ "A Certain Magical Index Gets Game by Namco Bandai, Guyzware". Anime News Network. June 8, 2012. Retrieved June 8, 2012. ^ "A Certain Magical Index & Scientific Railgun Converge on PSP". Anime News Network. June 29, 2012. Retrieved September 26, 2012. ^ "A Certain Magical Index & Scientific Railgun Crossover Game's 1st Promo Streamed". Anime News Network. October 9, 2012. Retrieved October 9, 2012. ^ "Mikoto Misaka and Kirino Kosaka Announced as Playable Characters in Dengeki Bunko: Fighting Climax". Shoryuken. Retrieved February 11, 2014. ^ "Music section at the anime's official website" (in Japanese). J.C.Staff. Archived from the original on April 3, 2009. Retrieved February 20, 2009. ^ ""Chikaigoto: Sukoshi Dake Mō Ichido" single listing" (in Japanese). Amazon.co.jp. Retrieved February 20, 2009. ^ "PSI-missing" (in Japanese). Geneon Universal Entertainment. Retrieved November 11, 2013. ^ "Masterpiece" (in Japanese). Geneon Universal Entertainment. Retrieved November 11, 2013. ^ "No buts!" (in Japanese). Geneon Universal Entertainment. Retrieved November 11, 2013. ^ "See visionS" (in Japanese). Amazon.co.jp. Retrieved December 17, 2010. ^ メモリーズ･ラスト [Memories Last] (in Japanese). Amazon.co.jp. Retrieved December 17, 2010. ^ "Fixed Star" (in Japanese). Geneon Universal Entertainment. Retrieved November 11, 2013. ^ "A Certain Magical Index Season 3's Theme Song Artists Revealed". Anime News Network. July 9, 2018. Retrieved July 11, 2018. ^ "Maon Kurosaki, Yuka Iguchi Perform A Certain Magical Index III Anime's New Theme Songs". Anime News Network. December 4, 2018. Retrieved January 13, 2019. ^ "Drama CD available through Dengeki hp" (in Japanese). Retrieved December 15, 2007. ^ "Drama CD information at the series' official website" (in Japanese). Archived from the original on November 21, 2007. Retrieved December 15, 2007. ^ ヴァイスシュヴァルツ 商品情報 禁書目録＆超電磁砲 [Weiß-Schwarz Merchandise Information Index & Railgun] (in Japanese). Weiß-Schwarz. Archived from the original on 2013-05-08. Retrieved March 29, 2010. ^ "Toaru Kagaku no Railgun Book Has New Episode Listed". Anime News Network. June 15, 2010. Retrieved June 17, 2010. ^ "とある魔術の禁書目録×電脳戦機バーチャロン とある魔術の電脳戦機（バーチャロン）" (in Japanese). ASCII Media Works. Retrieved February 13, 2018. ^ "Sega, Dengeki Bunko Develop A Certain Magical Virtual-On Collaboration Game For PS4, PS Vita". Anime News Network. March 12, 2017. Retrieved September 24, 2017. ^ "『とある魔術のバーチャロン』インデックス専用機が判明。キャラの能力を反映した第4の兵装が明らかに" (in Japanese). ASCII Media Works. August 22, 2017. Retrieved February 13, 2018. ^ ライトノベルアワード2007 [Light Novel Award 2007] (in Japanese). Kadokawa Shoten. Retrieved January 30, 2011. ^ Kono Light Novel ga Sugoi! 2009 (in Japanese). Takarajimasha. November 22, 2008. ISBN 978-4-7966-6695-4. ^ a b Kono Light Novel ga Sugoi! 2010 (in Japanese). Takarajimasha. November 21, 2009. ISBN 978-4-7966-7490-4. ^ a b c Kono Light Novel ga Sugoi! 2011 (in Japanese). Takarajimasha. November 19, 2010. ISBN 978-4-7966-7963-3. ^ Kamachi, Kazuma (October 10, 2007). Toaru Majutsu no Index no Subete」. ASCII Media Works. p. 126. ISBN 978-4-8402-4042-0. ^ 1億部突破の電撃文庫で最も売れたのは『とある魔術の禁書目録』 [Toaru Majutsu no Index Sells The Most for Dengeki Bunko] (in Japanese). Temple-Knights. May 5, 2010. Retrieved August 16, 2010. ^ ライトノベルの発行部数：シリーズ総計の目安 [Number of Light Novels Printed: Series Total Approximation] (in Japanese). Hatena Group. Retrieved August 16, 2010. ^ "「とある魔術の禁書目録」10周年イベント 「ヘヴィーオブジェクト」のアニメ化を発表". Anime Anime. IID, Inc. Retrieved July 16, 2018. ^ "電撃文庫 2017年夏のフェア" (PDF) (in Japanese). Kadokawa Corporation. Retrieved July 16, 2018. ^ "「とある魔術の禁書目録」第3期、主題歌アーティストは黒崎真音＆井口裕香" (in Japanese). Natalie. July 9, 2018. Retrieved July 11, 2018.